Eventually your car’s timing belt, serpentine belt and radiator hoses will dry crack and fail. Belts and hoses are just a few of the items that require monitoring and replacement because they lose the ability to expand and contract with the needs of your vehicle. Don’t get stranded, visit the Quick Lane to have your belts and hoses inspected with every oil change. Our Certified Auto Technicians report wear and tear on belts and hoses even before you need replacements so that you can plan and budget ahead even for maintenance replacement parts like belts and hoses. 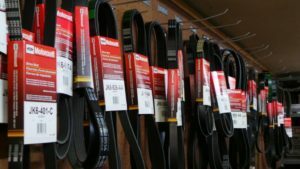 The Quick Lane Tire and Auto Center provides belts and hoses for All Makes & All Models, foreign and domestic – including yours! Regular maintenance partnered with the Quick Lane Vehicle Report Card helps to make you aware of the manufacturer’s suggested maintenance for your specific vehicle. Knowing ahead of time helps you plan and take better care of one of the largest investments you will likely make, your vehicle.